Ahmed Harqan, an Egyptian atheist who expressed his views on television, went to a police station in Alexandria to report that he and his wife were attacked on the street for his beliefs. Instead of receiving treatment as victims, Harqan and his wife found themselves handcuffed and physically and verbally assaulted by police personnel. “They switched on the Quran and raised the volume, as if by doing so they were torturing us. They called us names and kept slapping us,” he told Ahram Online. “I’m here to complain and not for you to inspect my beliefs. I will not speak about [religion],” Harqan responded. “You have to speak about [religion], even if it’s by force,” the prosecutor told him and refused to discuss the attacks on Harqan by strangers on the street and by the police. Harqan and his wife were eventually allowed to file a police report against those who beat them on the street, but were unable to file a report against police personnel. “We didn’t know any of their names, and their police colleagues refused to tell us their names,” he said. Not all atheists are as lucky as Harqan in avoiding being charged with blasphemy. On Sunday, 11 January, 21-one-year-old student Karim El-Banna was given three years in prison for announcing his atheism via his Facebook account and for insulting Islam. This law has also been used in trials against Muslims and Christians for insulting religion. A report published in August 2014 by the Egyptian Initiative for Personal Rights (EIPR) documented 36 cases where 63 citizens were charged between the 25 January 2011 uprising through the end of 2012 with defaming or blaspheming Islam. The 63 citizens include Muslims, Christians and atheists. 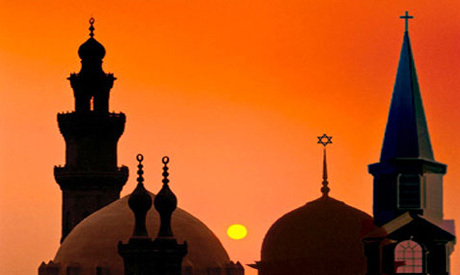 EIPR researcher Amr Ezzat told Ahram Online that although atheism is not mentioned directly in the constitution, the document is self-contradictory: it affirms that freedom of belief is an absolute, on one hand, but it discriminates against different religions and beliefs by only listing three religions — Islam, Christianity and Judaism — on the other. “The rest of the [beliefs] are outside the guarantee of freedom of religion,” Ezzat stated. The problem is not only with the constitution, according to Ezzat, as the constitution has been granting absolute freedom of belief since 1923. Ezzat says the problem is the legal framework, which is an accumulation of administrative decisions and many judicial verdicts that are against freedom of belief and having and practicing different beliefs. “Any form of belief different from the Islamic and Christian sects acknowledged by the state is immediately considered to be illegal, and thus a number of violations are committed against it,” Ezzat said. He added that even the practice of the acknowledged religions is restricted. For instance, authorities demand a permit before allowing someone to preach in mosques while the construction of churches must be sanctioned by presidential decree. Atheism has been a trending topic on Egyptian television stations lately, with programmes for the first time hosting atheists along with Christian priests and Muslim sheikhs. The hosts would ask atheists what made them abandon Islam and Christianity while the preachers discuss the possible problems they face in their lives, or growing up, that led them to atheism. The media has dubbed the phenomenon the "war on atheism,” and compared it to a number of wars Egypt has been waging during the last year and a half, such as those against terrorism and corruption. In December 2014, the head of Cairo’s Abdeen district oversaw a police raid on what he called an “atheist cafe” and closed it down. The ongoing campaign, called “weigh it with your mind,” sends convoys of sociologists, psychologists, and Muslim and Christian preachers across Egypt to speak to youth about atheism. Sheikh Ahmed Turky, responsible for the portfolio of atheism in the Ministry of Endowments and a coordinator in the ministry's anti-atheism initiative, told Ahram Online that the initiative aims to "arm youth with scientific responses to atheistic claims, so that they wouldn’t be lured to it." At this point in time, the initiative only talks with Muslim and Christian youth and not to atheists, but Turky says that this may change in the future. “If [atheists] rebel against religion, they will rebel against everything,” he added. Mainstream media has spoken of a “war against atheism,” but do atheists believe that there’s a war against them? Harqan, despite being allegedly beaten by police, doesn’t believe so, citing Al-Azhar and the youth ministry’s statements as diverging from the state’s actual position. “The state is not waging a fight against atheism; the media is the one who’s saying that,” he stated. “We cannot say that Al-Azhar is the state, and the youth ministry’s initiative is silly and overhyped,” he added. Another atheist, Ismail Mohamed, is of the same opinion. Mohamed told Ahram Online that he believes President Abdel-Fattah El-Sisi and his government are more open to atheism. “I believe El-Sisi understands the backwardness we’ve reached by way of prior religious speech. [El-Sisi] saved us from the darkness of Muslim Brotherhood rule,” Mohamed stated. Both Harqan and Mohamed cited media reports of El-Sisi, in a meeting a month ago with intellectuals, speaking in favour of atheists. Author Ibrahim Abdel-Maguid, among some two dozen intellectuals who attended the meeting with the president, told Ahram Online that El-Sisi didn’t take a stance with or against atheists, but said everyone is free in their beliefs and that no one should interfere in them. “El-Sisi expressed that he doesn’t have a problem with [atheists],” Abdel-Maguid added. Indeed the president has made comments on religious discourse during the last week. El-Sisi spoke in front of Al-Azhar’s religious scholars in a televised speech demanding a "religious revolution" on old texts and ideas that have been held sacred for hundreds of years. The president said that these ideas are causing "worry, danger, and destruction to the whole world." However, atheists are still being tried for blasphemy and the president has yet to express his stance on atheism publicly. On the other hand, Ezzat believes that the term “war on atheism” is not far from the truth. He described the state’s behaviour as being “anti-freedom of belief,” refusing to call recent incidents “isolated." “There are some youth who thought the Muslim Brotherhood was the greatest danger, so now they’re attempting to justify the state’s behaviour by saying that these are ‘isolated practices,’” Ezzat stated. “We cannot call Al-Azhar’s Grand Mufti’s stance or the youth ministry’s position ‘isolated incidents,’” he asserted. Ezzat suggests that the real "isolated incident" would be a policeman in Egypt releasing someone like Harqan. Sheikh Turky said the endowments ministry is not waging any war and that the term “war” comes from the media's exaggerations. "This is not a war, but a preaching initiative; it doesn’t exceed dialogue," he asserted. Although Mohamed is content with the current regime and its treatment of atheists, he wishes some laws would be adopted, such as a civil marriage law that would allow interfaith marriages or atheists to get married outside of the church or the mosque. In October, Egypt’s Dar Al-Ifta, responsible for issuing religious edicts, published a report on its website saying that Egypt has the highest number of atheists in the Middle East — exactly 866 out of some 87 million Egyptians. The report quoted a poll it said was conducted by Irish polling group Red C, but some have questioned how credible the number is. Equally there has never been an exact figure of Egyptian Christians, a minority said to be 15 percent of the population. However, in September, Egypt’s former Grand Mufti Ali Gomaa said at a student conference that a study was conducted by Al-Azhar on atheism involving 6,000 youth. Gomaa said Al-Azhar managed to persuade 10 percent of the atheists in the sample to revert back to Islam, “but there is still a long way to go,” he added. Sheikh Turky said that it's very hard to put a number on atheists, but he believes they constitute "a few thousand" across Egypt. On the other hand, Ezzat, whose initial reaction to the 866 figure was, “I know more atheists than that,” cast doubt on the numbers. He stated that any research on atheists in Egypt should consider the fact that if someone announces they’re atheist, they risk having their lives ruined or even ended. thus, the actual number is unknown. “They can’t be issued a national ID; they can’t get married, along with all the other societal problems that they would face,” he explained. In places like the US and Europe, according to Ezzat, studies can be conducted on believers and atheists without obstacles. “But in [Egypt], studies on atheism are conducted to measure their numbers, in order to denounce the phenomenon, solve the crisis and calculate the amount of danger they pose to society,” he stated. Meanwhile, Harqan finds Gomaa’s 12.5 percent to be more believable than Red C’s 866 in total. “If the state preserved and protected the rights of minorities, the numbers of those who reveal they’re atheists would increase tenfold,” Harqan said. The Dar Al-Ifta report asserts that atheism has witnessed “large activities in the last four years,” citing the appearance of "tens of websites calling for atheism and defending atheists." This statement is backed up by both Harqan and Ezzat. Ezzat said that the state is facing a “new society” following the 25 January 2011 uprising. “Many people are now starting to express themselves more freely and are demanding their rights,” he explained. Harqan, who became an atheist in June 2010, said that he found other people with the same beliefs through social media and internet sites. He said that the people he met online were an encouragement to him. “In the beginning, I thought I was the only one having these thoughts,” he added. But while it’s debatable whether or not the state is waging a war on atheism, there’s no doubt that society at large is still not willing to accept atheists among its ranks. Student El-Banna, sentenced to three years in prison for blasphemy, was reported to the police by his own father, which is not an unusual phenomenon, as most blasphemy cases are reported by family members and neighbours. They should not forget that Egyptian constitution is based on Sharia. I do not support persecution of any one but West has supported the persecution of Muslim brotherhood in Egypt. They are no different from the people they criticize. Alexandria,once the hub of the world for engineering and science,today just another region of religion and ignorance. An important distinction to make for people who do not believe in Religion but still believe in God, they are Agnostic, not Atheist. And to refer to Sam’s good point below; we should not be surprised if someone walks away from religions. Considering that most wars, violence, and killings in recent years were committed in the name of religions. Agnostics are NOT non-believers, they are, and they are fed-up of the superficialities of religious followings these days. Agnosticism and atheism are not mutually exclusive. Agnostic atheists don't claim to KNOW if a non-personal god exists. You either believe in a god or don't. You can be an agnostic in both cases. Great land of Egypt ,land of such great ancient belief ,can be even greater ,with freedom of beliefs n maat u dont stop luv it. create the opposite effect. They are also usually very insecure in their own beliefs. I just remember a sentence from Alaa al Aswani from his book "On the state of Egypt: "...moral without religion is much better than religion without moral...."
I am sorry to tell you that, but with this kind of reaction, Egypt and all the muslim countries are far to leave the world of obscurantism that maintains you in such underdevelopment. This verse, as far as I'm aware, refers exclusively to those who have never embraced Islam. However, apostasy carries its own specific rulings. It seems to an outsider that religion in Egypt as become a matter of public show separated from what people really believe. Punishment, not hope, seems to be the topic of sermons. There is a disconnect between, 'God, the Most Merciful and All Compassionate,' and religious institutions that too often paint God as an enity looking for any excuse to send you to Hell. There is an good saying, 'The God you Fear you cannot Love. The God you Love you cannot Fear.' Most atheists I have seen have lost faith not in God but in the institutions that claim to represent Him. The institutions have lost contact with the faithful. To be guilty of blasphemy, one must be a member of the faith. What is blasphemy to a Christian will not be so to a Muslim. The religious institutions must work to bring people to the faith, not drive them with a stick. Forced belief is hypocrisy, religion fronts for the neighbors, not God. Super like, you've said it all!